What you choose to wear for work should say something about who you are. When I see someone wearing red, the first thing that comes to my mind is energy. I personally relate the color red with an energetic and passionate person. Someone that wears red doesn't mind to get noticed because he/she is confident, bold and possesses internal strength and courage. I humbly will say that I can identify myself with most of these characteristics, therefore, bringing a red suit into my "Monday Work Outfit" series was a must. Tip #1. Red can be worn with any other bold color, however, if you want to let your red suit do the talking, then pair it with neutral colors only. Tip #2. If boldness and high visibility are important in your style and you still insist on wearing a non-neutral color garment with your red suit, I will recommend to wear it with pastel hues. Try a baby pink or antique pink. This shade of red will also look terrific next to a light teal or a mint green. Each of these colors will compliment a suit like this without stealing its thunder. I personally don't mind to wear red in general with any color, however, for the office, most people will let it shine on its own. Tip #3. 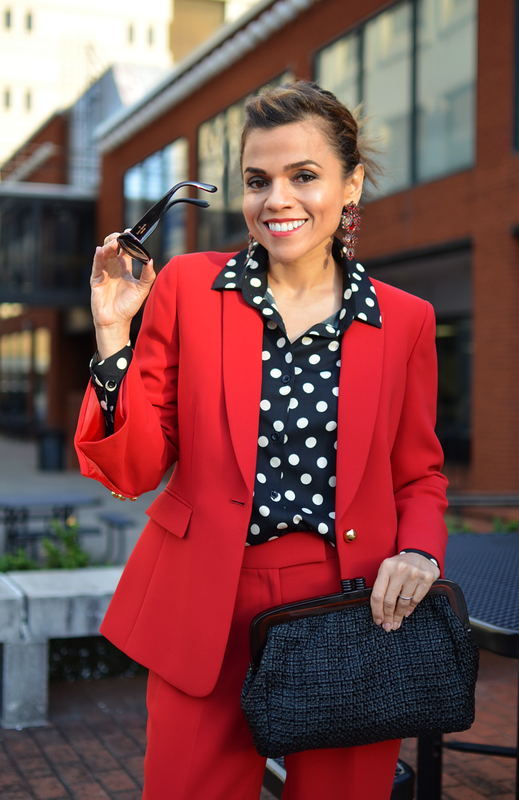 Wearing prints with your red suit is my favorite styling. 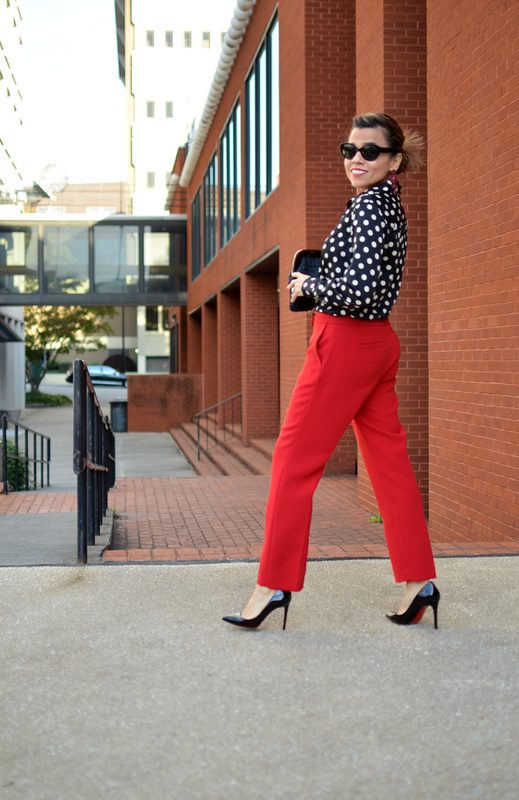 As you can see, I paired mine with this must-have polka dot silk blouse. Any pants suit, in general, can benefit from a playful print that won't jeopardize it's polished look. In other words, look tailored, not uptight. Tip #4. Regardless of the style or brand of the shoes that you choose to wear with your red suit (any suit), make sure you grab a well-groomed pair. A poorly maintained shoe can totally wreck the look of even the most expensive suit. Color-wise? Neutral or a neutral printed shoe will compliment your suit, regardless of what color blouse or bag you take. And tip #5. Jewelry is always important, however, I love the idea of pairing red with red-stoned jewelry such as rubies, garnets or red Swarosky crystals. Whichever color or metal you opt to wear with your red suit, restrict your jewelry to one or two pieces. The word busy is key for work but not with your outfit. 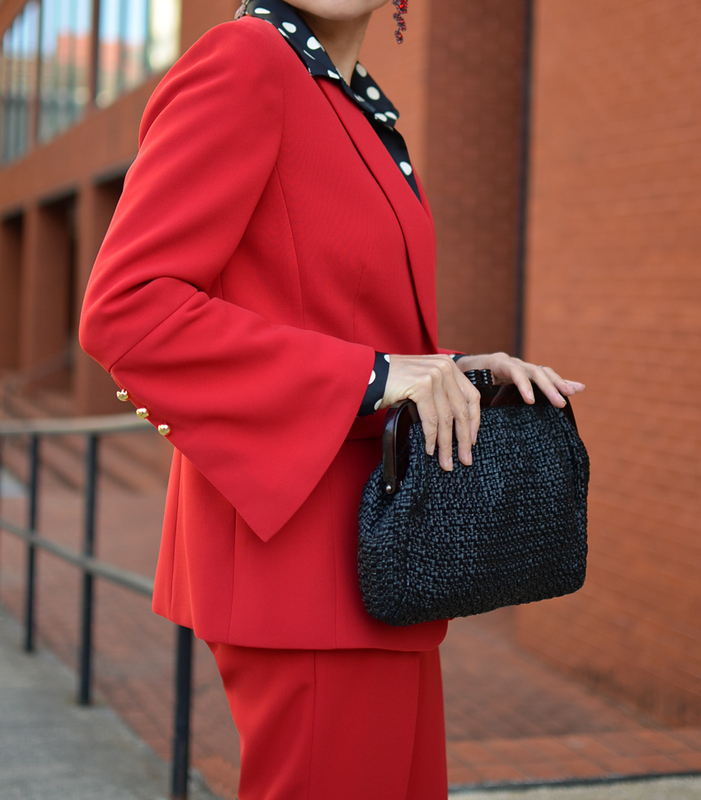 I hope you enjoyed the polished and yet playful way I styled this fun suit. My tips are personal and they aren't rules. 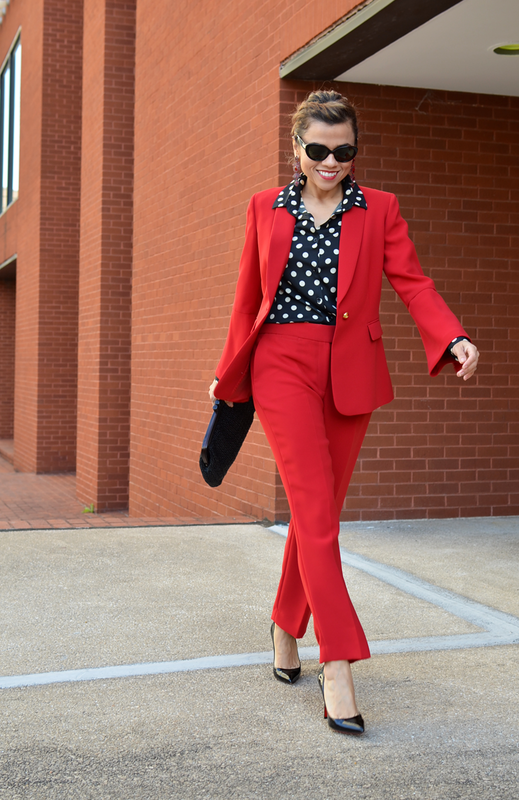 You should wear your red suit the way you love it in order to display confidence at work in every step. 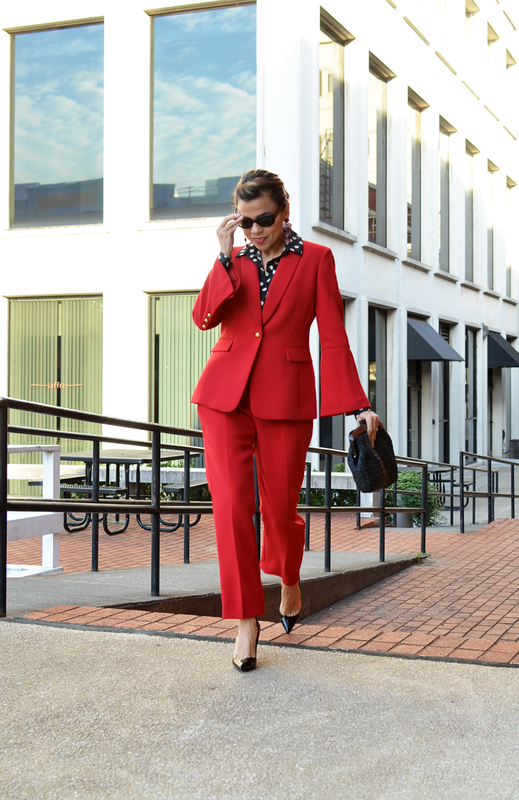 Pantsuit: Tahari ASL/Blouse: c/o The Fable. See similar/Shoes: Christian Louboutin. See similar/Bag: Vintage. Similar/Sunglasses: Kate Spade (old). Newer version/Earrings: Givenchy (old). Similar.